From modern to traditional, thinking about home style seems obvious when you’re shopping home plans or evaluating different architectural options. However, the overall style of your home actually matters for all aspects of its design, right down to the bathroom sinks. 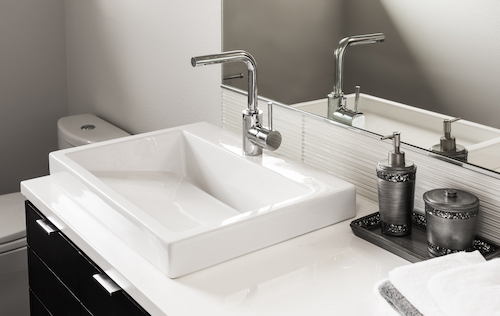 With that in mind, how can you select bathroom sink styles that are right for your home? Whether you’re building or remodeling, here are some tips for picking the best sinks to complement the rest of your residence. If you’ve already picked fixtures for your kitchen or other bathrooms, start there. What shape, colors, design, etc., of sinks did you pick? If you went with an under-mounted stainless steel kitchen sink that has squared corners, for example, you went with a sleek and modern kitchen sink look. If you have white, decorative pedestal sinks in the powder rooms, you may have a more cottage-like, charming feel. Paying particular attention to the sinks already in place in the home, figure out what style most appeals to you. If, on the other hand, this bathroom will be the first style choice you’re making, browse the Internet or bathroom stores to explore possibilities and determine what look you like best. Understanding all the possibilities is crucial when you’re trying to determine style preferences. There are under-mounted sinks, set beneath the countertop in a vanity; as well as above-counter sinks, which place a sink directly on top of the counter. Pedestal sinks stand alone, without storage space, but can create a strong statement and a more minimal bathroom look. Other options include one-piece console sinks, vessel bathroom sinks and drop-in sinks, each of which has a distinct look and feel. Think about Space or Budget Limitations. A double vanity won’t fit in a tiny bathroom any more than a pedestal sink will provide sufficient storage space for a huge one. Before picking the sinks for your new bathroom, determine what limitations you are facing. From the room’s square footage to the amount of money you have to invest, knowing your constraints can provide helpful parameters from which to make your decisions. 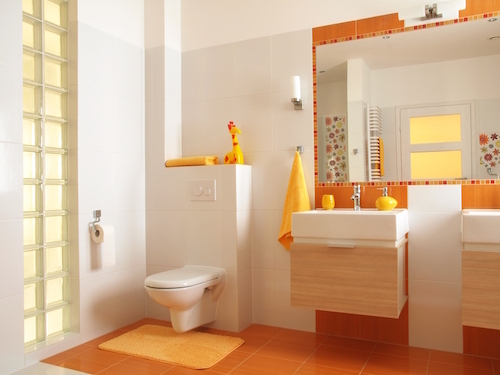 Looking at the bathroom as a whole, think about what colors and materials you like best. Will you want the color of the countertops to contrast or match the color of the sink? Do you want all the bathroom fixtures to go together? From brushed nickel to stainless steel, there are various different fixtures available, just as there are various colors of sink, from white to black and everything in between. Think about your sink choice in relation to the bathroom as a whole, then consider all the bathrooms in the home. Finally, think about it in relation to your entire home’s sense of style. Are you building or remodeling a home and looking at bathroom options? Go to Modern Bathroom to browse bathroom sinks of all kinds, such as the glass vessel sink and more. We make it possible for you to save up to 70 percent, while also offering free shipping and a low-price guarantee. Click here to view sinks! What Works Best for You. Do you like to take showers or baths? What about the other members of your household? 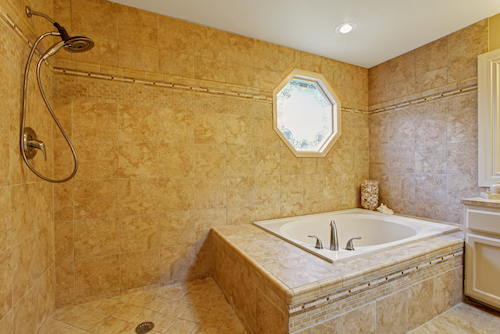 If you like being able to take baths, would you enjoy having a big soaker tub? If so, is there room to work it in the bathroom’s layout? Consider what space you have to work with and compare that with your preferences. Knowing what you and your family will use is key in the decision process. When you’re trying to decide, go with what works best for you, not what someone else says is a good idea. Budget and Space Constraints. 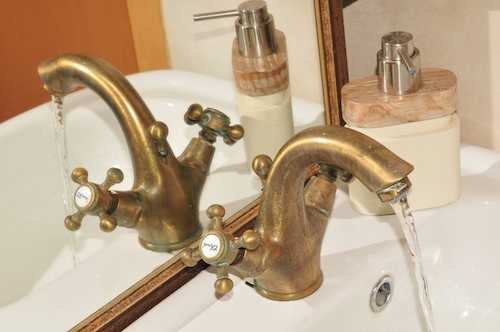 Installing separate fixtures is typically more costly than installing a one-piece combination, so if budget is a big consideration, find out what you can afford. Likewise, if your bathroom is too small for separate fixtures, you may have to stick with either a walk-in shower or a combination. Potential Resale Value. While what works for you should be the top consideration when remodeling, it’s OK to think about resale value, too. Talk to real estate professionals and compare the value of different options in homes in your area. Which modern bathroom styles would yield the greatest potential resale value? What Families Like. If the bathroom is your house’s only bathroom, you will probably want a tub of some kind — either in a combination or by itself. That’s because, even if your household doesn’t prefer baths, potential buyers will likely include families, and families will typically want tubs for kids. More Uses for More People. Having a separate shower stall and tub allows for two people to be cleaning up at the same time, one in the walk-in stall and one in the soaker tub. This is why it’s a nice feature for master bathrooms that are often shared by two people. Are you planning to remodel your bathroom and trying to decide what to add and what layout will be best? Come to us! At Modern Bathroom, we have the bathtubs and shower doors and enclosures you need to get your bathroom looking beautiful. What’s more, our experts are happy to help you determine which layout and features to select. Contact us today! Do a Deep Clean. Before redecorating, take a cue from the home tradition spring is most famous for and give your bathroom a good spring cleaning. Getting the bathroom vanity, shower, tub, toilet, tile and light fixtures in gleaming condition is a great way to make the space feel new — ready for your artistic touches. Change the Artwork. From autumn photographs to red and green Christmas frames, there are lots of ways to use the things you hang on the walls to celebrate the season. In spring, consider hanging photos of green trees, for example, just as in summer you might hang photos of trips to the beach. As long as your modern bathroom walls are neutral, it’s simple to add different accents each season that create a new color scheme. Pick some hues that feel like spring to you, from lots of white to shades of green, and incorporate them into the room’s design. Swap Bathmats. Take out the dark, heavy bathmat hues that signaled winter and replace them with lighter, brighter colors for a new spring season. Brightening things up fits with the longer daylight and warmer temperatures of spring, and it turns your bathroom into a cheerier place to spend time. Do the same with your towels and shower curtains — from darks to lights — to make the room feel ready for spring. Add a New Scent. From the hand soap at the sink to an air-freshening plugin by the counter, there are lots of ways to imbue spring smells in your bathroom to celebrate the time of year. Pick something with a clean smell to highlight what defines this season — something like rain fresh or a floral smell works well. When you want to give your bathroom a lively spring look, use the tips above to get started. Season touches are a great way to have fun with your home and make it feel more cozy and loved. When little decorating touches aren’t enough to get your bathroom looking good, it may be time for a spring remodel. When it’s renovation that you’re after, come to us at Modern Bathroom for info. From beautiful vanities to modern sinks, we have the bathroom products you need to get your room looking showroom-ready. Contact us today to learn more! Gather Your Gear. Cleaning the bathroom doesn’t require a long list of products or tools, but you will want to have a few essentials on hand. Gather tools like a toilet brush, toilet cleaner, cleaning cloths or rags, a bucket with warm and soapy water, disinfectant and glass cleaner, for example. Start with a Blank Slate. After getting your bathroom cleaning tools ready, step one in giving the bathroom a thorough cleaning is to pare it down to the essentials. Empty the room by removing all towels, bathrobes, washcloths, trashcans, bath rugs, baskets, toiletries, etc., so that surfaces are cleared and ready to be cleaned. Only after you’ve finished scouring everything from top to bottom should you re-introduce daily products and linens into the space. Empty the Cabinets. Go through the items in your cupboards and drawers, and organize items into trash, donations and things to keep. Wipe the inside of these spaces before putting items back, with everything you want to keep neatly organized. Scrub the Sink. Scrub the bathroom sink, paying special attention to little nooks and crevices. Wipe the faucet and handles until they’re sparkling. Clean the Toilet. Use a toilet brush to scrub the inside of the toilet and remove any rings, stains and other debris. Then, use a cloth to wipe the toilet’s lid, handle, small crevices and underside. Wipe the Mirror. From spots of hairspray to splatters of water, lots of little things can leave smudges and speckles on your bathroom vanity mirror. Use a good class cleaner with a wipe or paper towel to remove those smudges and make the mirror streak-free. Clean the Shower and/or Tub. Whether you have a glass-enclosed shower, a shower-tub or a stand-alone tub, clean that part of the bathroom thoroughly. If the shower curtain has mildew or mold, consider replacing it with a new version. Mop the Floor. Last but not least, sweep and/or vacuum the floor to remove all crumbs, hair and debris. Wipe baseboards. Get a bucket and a mop and thoroughly clean the floor. Empty the Trash. The trashcan you removed at the beginning of the cleaning process can now be put back in the bathroom — after emptying the trash. You may also want to wipe the trashcan inside and out. Return Linens. Once the bathroom is completely cleaned, you can put back the towels, washcloths, bathrobes and other items kept in your bathroom on a regular basis. Also, as a reward for a job well done, consider getting some fresh hand soap or toiletries for a finishing touch. 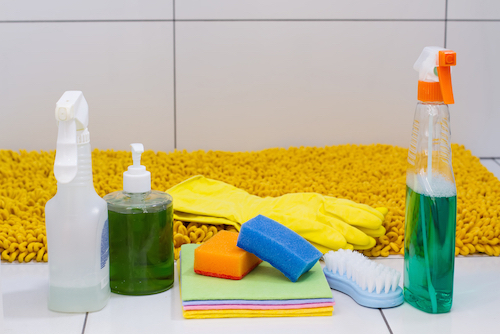 Getting your bathroom back in pristine condition is a worthwhile undertaking at the beginning of the year, so follow the tips above to tackle this spring-cleaning project at your home! If you’re interested in updating your bathroom with more than a fresh cleaning job, talk to us at Modern Bathroom. We specialize in all kinds of bathroom vanities, faucets, sinks, tubs and other fixtures, and we’ll be happy to set you up with the best in new features!